Fielding Lucas Jr. first advertised an “Elegant New Atlas” as published and for sale on 10 February 1814, claiming, “There being now no other genuine Modern Atlas of the United States, nor any other likely to be had for some time to come –“. He was half correct. There certainly was no other “modern” atlas available for maps of the United States on that date. Mathew Carey’s most recent General Atlas (1811) contained state maps that had not been updated since their original publication in 1795. However, within the same year as Lucas’s atlas, Carey published a new edition of his General Atlas with all new state maps. No copy of A New and Elegant General Atlas by Fielding Lucas (or any subsequent atlas by Lucas) has a dated title page. Assigned dates for surviving copies of his first atlas are based primarily on two state maps and the U.S. map. The earliest Virginia map was a single page map with no date. A double-page Virginia map with an 1816 publication date followed. Likewise, the map of Louisiana was initially a single page undated map, followed by a double-page map with an 1817 publication date. The U.S. map initially showed a “double-wide” Mississippi Territory, but was revised (presumably after Mississippi statehood in December 1817) to show the state of Mississippi and Alabama Territory. Lucas’s earliest atlas contained 31 maps, eventually increasing to 54 maps. The 1814 advertisement also included a statement about subsequent expansion of the atlas with additional maps. “F. LUCAS, Jr. has in preparations Twenty Maps of the different divisions of Europe and Asia, which will be ready for delivery in the course of the ensuing summer.” It is probable that the “Twenty Maps…” were delayed a few years. The atlas held by Ohio State University has the 1816 dated double page map of Virginia, yet still only contains 31 maps, similar to the 1814 issue. 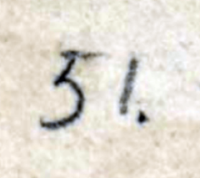 Manuscript page numbers, if present, can provide a general idea of the date of publication for an extracted map. For example, the North Carolina map in the 1817 (or later) copy of the atlas in the Library of Congress has a “51” added in manuscript, while the pre-1816 copy in the David Rumsey Collection has a manuscript “22” on the North Carolina map. Detail from NC map in 1817 (or later) atlas by Fielding Lucas, courtesy Library of Congress. The single page map titled “N. Carolina” was unchanged throughout the publication history of A New and Elegant Atlas. The map was drawn by Samuel Lewis and engraved by Henry Tanner. 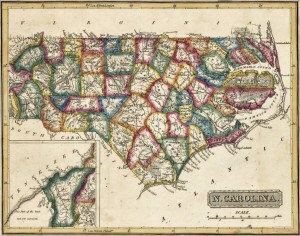 Continuing a distasteful practice established by Lewis in 1804, at least with respect to maps of North Carolina, the far western part of the state is chopped off from the main map and placed in an inset. For the Lucas atlas map, Lewis drew heavily from the 1808 Price-Strother map. That map was based on 1799 and earlier surveys. Lewis depicts sixty (of 62) counties, omitting Haywood and Columbus (both established in 1808). Like Price-Strother, Lewis shows Glasgow instead of Greene County. 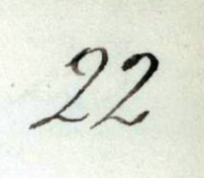 The name had been changed in 1799, likely after that portion of the Price-Strother manuscript had been completed. On the Lucas atlas map, Chatham County is shown, but unnamed. Leaving a county, or two, unnamed was a recurring oversight by Lewis, as can be seen on the Carey 1814-1816 General Atlas maps of North Carolina, also drawn by Lewis. In November 1823, Lucas published A General Atlas Containing Distinct Maps Of all the Known Countries in the World, Constructed from the Latest Authority. This atlas contained a double page map titled “Nth Carolina”. This map was “Drawn and published by F. Lucas Jr. Baltimore“, and engraved by B.T. Welch & Co. In the interval between these two atlases, Lucas published what could be termed a “transitional atlas”, under the title, A General Atlas, Of All The Known Countries In The World. (Since the three atlas titles are easily confused, I’ll continue to refer to this one as “transitional atlas”.) As with its predecessor and its successor, the “transitional” atlas has an undated title page. The earliest reference to its publication is possibly 1820. In May of that year, Lucas advertised “an elegant GENERAL ATLAS”. By September, the wording had been changed to “a new general 4to Atlas”. The lack of dated title pages and the vagueness of Lucas’s newspaper advertisements leave much to conjecture. Although all Fielding Lucas atlases are rare, the “transitional atlas” appears to be the rarest. Copies are held by David Rumsey, the Boston Athenaeum, and Arizona State University. The Library of Congress lists a copy in its catalog, and earlier authors have confirmed its existence, but that atlas could not be located in July 2015. In Lucas’s “transitional atlas”, it is possible that he gradually replaced the 1814 atlas state maps with 1823 atlas state maps as they became available during the years 1820-1823. 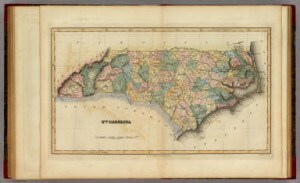 As evidence, the Boston Athenaeum’s copy of the “transitional atlas” contains the single page Lewis/Tanner map of North Carolina. The Rumsey copy and the Arizona State University copy each contain the double page Lucas/Welch map of North Carolina, albeit in an earlier state than is generally found in the 1823 atlas. If someone has the time and resources to visit Boston, San Francisco, and Tempe, a detailed collation of all maps in these Lucas “transitional atlases” could be enlightening. American and Commercial Daily Advertiser (Baltimore, MD), Vol. XXIX, Issue 4598, Page 3. Imprints: “S. Lewis del.” and “H S Tanner sc.” below title block on left and right, respectively. each of the United States. Baltimore. Printed and Published By Fielding Lucas Junr. and Philip H. Nicklin Philadelphia. Copyright Secured. Atlas location: Library of Congress (3 copies); David Rumsey (4 copies); Dave Morgan; and others. Imprints: “Drawn & Published by F. Lucas Jr., Baltimore.” (bottom center), and “B.T.Welch & Co. Sc.” (bottom right). Published in: A General Atlas, Of All The Known Countries In The World. Map location: No separate copies have been located. Note: This map does not show Davidson County, erected in 1822. 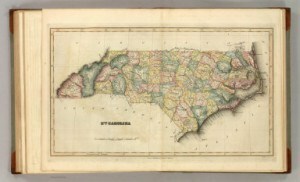 Map location: North Carolina Collection; and others. Atlas reference: David Rumsey List, Number 4584; Phillips 742. NOTE: This map shows Davidson County, distinguishing it from state 1. Of the above maps, the second state of Map 2 is the one generally encountered in the map trade. Map 1 and the first state of Map 2 are very scarce. Occasionally, one may find the second state of Map 2 with original color using the coloring template for state 1. I.e., the engraving includes Rowan and Davidson counties, but the color scheme shows them as a single county. In addition to the maps in his own atlases, Fielding Lucas Jr. also drew many of the maps (including North Carolina) for the atlas published by Carey & Lea in 1822, with revised editions up to 1827. The cartobibliography for that North Carolina map will eventually, perhaps, be discussed separately. It was briefly touched upon in the Cartographic Winds of Change post a few years back. Acknowledgement: Most of the information was obtained from the David Rumsey Collection and from David Morgan of the CARTE Museum. However, I may have introduced factual errors. Corrections would be most appreciatively received via the “What’s on your mind?” comment box below. Comments or questions are also invited. This entry was posted in 19th Century, Cartobibliography and tagged cartobibliography, Fielding Lucas, Fielding Lucas Jr, north carolina maps by crmaps. Bookmark the permalink.